Thursday was Duchess's last week of Kindergarten. It all went so fast. 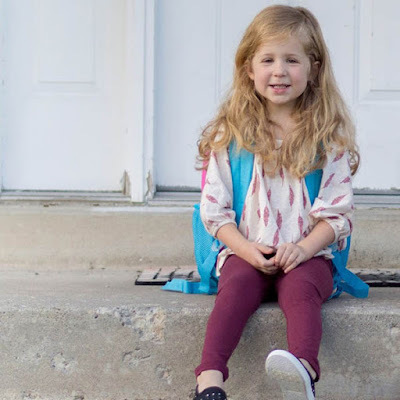 She has grown and changed so much since Stevie and I first walked her to the door of the school, watched her line up, and march into her new school in an adorable orderly line. I'm sure I was more nervous than she was. But I shouldn't have been. She had Mrs. Johnson. Mid-way through the school year I got the opportunity to volunteer in my daughter's class. It was fun to watch my little girl and her friends interact and play, but my favorite part of the experience was getting to see Mrs. Johnson handle a room full of five and six-year-olds. In my life I have seen people fly planes. I have seen captains steer ships. I have never seen a person direct a symphony of potential chaos and energy in the calm, kind fashion that Mrs. Johnson handled those kids. I like to pat my own back for what a great kid my daughter is, but I realized that day that I had a ringer on my side. Teachers are so amazing. Anyway... when the end of the year came around I wanted to send her a note of thanks and glean any additional knowledge I could from her. So I sent her the following e-mail. This is John, Duchess's dad. I wanted to send you a quick e-mail thanking you for all of the wonderful experiences Duchess has had in your class this year. It has been a rewarding experience for all of us. She has just blossomed over the past months, and listening to her read to me before bed is consistently the highlight of my day. Thank you so much for all of your hard work. It is obvious how much you care about our daughter, and I hope you know how fond she is of you. We love hearing the stories she brings home. With the summer coming, I'd love to get the chance to chat with you a little bit about how we can keep up the momentum you've established. Duchess is coming out of your class with a love or numbers, reading, and learning in general. I want to make sure we continue to foster the learning-positive environment in our home that you have set up in your class. I'd be incredibly grateful for any advice, guidance or suggestions you might have. I'd be happy to stop by and chat any day this week if you have time. If not, I understand how busy the end of the year can be. Thank you again for a wonderful year, and for playing such a pivotal role in our daughter's education. The other day I asked her if she was excited for summer vacation. 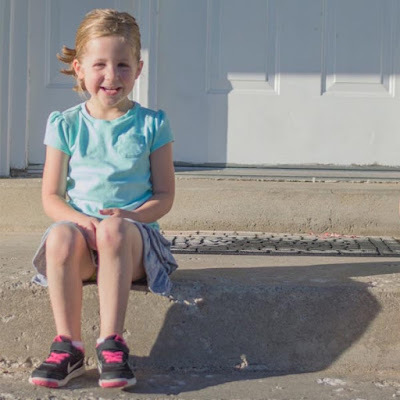 She paused for a second, then replied "I'm excited I get to be in first grade, but I am sad that I won't be in Mrs. Johnson's class anymore." Stevie and I both feel the same way. Today I received her reply, and it has so many great suggestions I just had to share it here. Thank you for your kind words. I loved having your daughter in class this last year. She is a sweetheart! I have a few ideas for your darling daughter for the summer. Keep her reading and writing! Let her get her own Library card and go to the Library often. They have a section of easy readers for children learning to read. You could also read one of your favorite books to her and discuss it to build comprehension skills. She could draw a picture and write a sentence about her favorite part. The Library also has summer programs she can participate in. Give her many opportunities to learn and experience new things. You could go on small field trips around the valley. Talk about what she sees and learns. Get her a journal or notebook to draw pictures and write about her experiences. Don’t worry about her spelling everything correctly. Do have her capitalize and punctuate. Help her sound out the words. You could teach her the silent e or -ing rules if she asks for help. This should not be a chore but a fun way to remember the fun she has over the summer. I sent her Lexia number home the last day of school. She can continue to play reading games on the web site all summer. It will give her challenging learning opportunities at her level. The district web site has a link for extra learning opportunities. If you click on the parents tab there is an A-Z directory. Click on Homework Helps for some web site ideas. There is a web site I like called Happy Hooligans that has fun crafts and learning activities. You might create an account with Teachers Pay Teachers and download learning activities. There are many core aligned sets and many of them are free. Costco often has workbooks. So does the dollar store. Teach her some new skills. She can go to Home Depot on Saturday mornings and build things in a program they have for kids. She could help plant a garden and learn about different plants. She could learn how to read a recipe and make cookies. Let her talk about the steps in order for each activity. Let her help choose the activities and have a fun summer! So there you have it! So many good ideas! I am so grateful for all the love and hard work Mr's Johnson gave to our daughter. I know public schools get a bad rap sometimes, but I can't imagine a better Kindergarten experience than the one she gave our family. This morning, as with most mornings, Duchess came up and crawled into bed with Stevie and I when the sun came up. Half asleep I heard her say "Dad, I don't have Kindergarten today." "Nope, you're on summer vacation." "When is summer vacation over? I want to go back to school." If that's not the best review a kid can give, I don't know what is. If you enjoyed this post I would honored if you would share it. If you hated it, I would still be pretty stoked if you shared it with a comment like "Look at how horrible this post is." You can also come be nice or mean to me on Facebook! You think they grow out of the love of school (and my eldest did) but my youngest daughter is 15 soon and still loves school. It's great when teachers make the effort to communicate with parents. Any way your themes are nice one. Good topic. From your post I could understand that you have well idea. You have to try to add more creativeness in your post. It will soon attract any reader. There are some different types of writing technique such as style, design, format.If you include all these styles you can make your blog more attractively. Visit : Best thesis writing service . These are great tips for students and also very good post for school college and also for university students, as writer I also help students and provide custom help in dissertations writing and I thin you are also doing your best job, Happy to see your post.